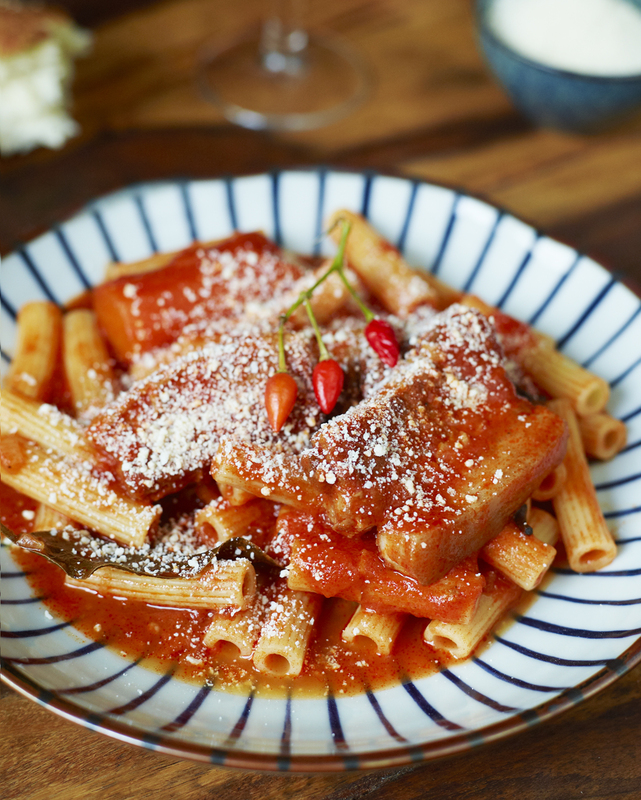 This pasta with its slow cooked pork is one of Carlo’s standard recipes. With the rich saltiness, smooth pork with a twang of spicy, it’s hearty comfort food and perfect for these cold winter days. Making the sauce is easy-peasy, but need some time on the fire and if you happened to end up with leftovers – it tastes even better the following day. Peel and finely chop onion and garlic. In a large pan over medium heat add olive oil when hot add onions and garlic cook until soft and golden. Cut the meat in medium-sized chunks, and let sear in the pan with the spices. Peel and cut medium-sized pieces of carrots. Add them to the pan along with the red wine, strained tomatoes and sugar. Simmer with the lid at medium heat for half an hour. Add water and turn down the heat. Let the sauce braise (slow-cook) for 60 minutes on low heat. Add more water if needed. Cook the rigatoni pasta according to instructions on the package. Mix the sauce and pasta together and serve immediately with fresh grated Parmesan cheese. This entry was posted in Pasta Recipes and tagged Anna Huerta, garlic, http://www.annahuerta.com/, olive oil, Pantelleria, Pasta, pepperoncino, pork, rigatoni, Sicily, slow braised pork, tomatoes, Under the Almond Tree on January 23, 2013 by Anna Huerta.